We had a long winter and spring came 5 weeks late for us and the weather has been a bit on the unpredictable side, storms and lower than normal temps. Just when I started to wonder would summer ever be here, then I saw these at the grocer. I had been disappointed a few times this year, but these were different. They had that sweet wonderful smell of in season strawberries and they were so sweet too. I had to do something with it. Mr Wonderful always tells me he doesn't care for sweet and he will eat anything... Well, well, everyone has a preference... and the truth is, he likes pies. I made a simple quick Strawberries pie for our Memorial weekend. Roll out 1 sheet of the pie crust and put in a 8-inch pie plate, brush the crust with beaten egg white. Set a side. Add Tapioca, toss well. You can use cornstarch. I prefer tapioca in berry and soft fruits pie.The taste is cleaner to me and the fruit gel tighter and make a better presentation when you serve. Pile the strawberries into the prepared crust. Arrange the strips over the top of the pie in a lattice pattern. Use a fork and crimp down the edges, trim off any excess strips. Take 1 tbsp of yoke, mix with 1 tbsp of mix to make the egg wash. Brush the top. Place pie on a foil lined baking sheet. It will bubble over, the foil will save you a lot of cleaning up later! Bake the pie for an hour and until the top is golden brown. Whenever I hear "Kūlia, HULI!" that usually came in the voice of my Kumu Hula (Hula teacher). I would usually be "brain-dead", stuck in a position and forgot to turn.. It's Memorial day weekend, the official opening for Grilling season. I know everyone can use a simple marinade. Huli huli chicken came to mind. The base for huli huli chicken is the marinade. Here is my version. I usually make a small batch and use it with fish, especially salmon, pork, chicken or even firm tofu. With requests from a couple of friends, I am making this a simplified version by using some of the "jar" products. 2 tsp crushed ginger or 2 tsp fined grated. Combine BBQ sauce, salt, brown sugar, garlic, ginger and lemon juice. I use Hawaiian red salt with this. It gives the marinade a smoky earthy flavor. Add A LOT of pepper (to taste) and sherry. Mix well. Pour in a jar and store in the fridge, used within a week. Marinade the meat overnight, fish or tofu for a couple of hours. This is great with pork. 5 heads to a pot of Creole Lobster soup! 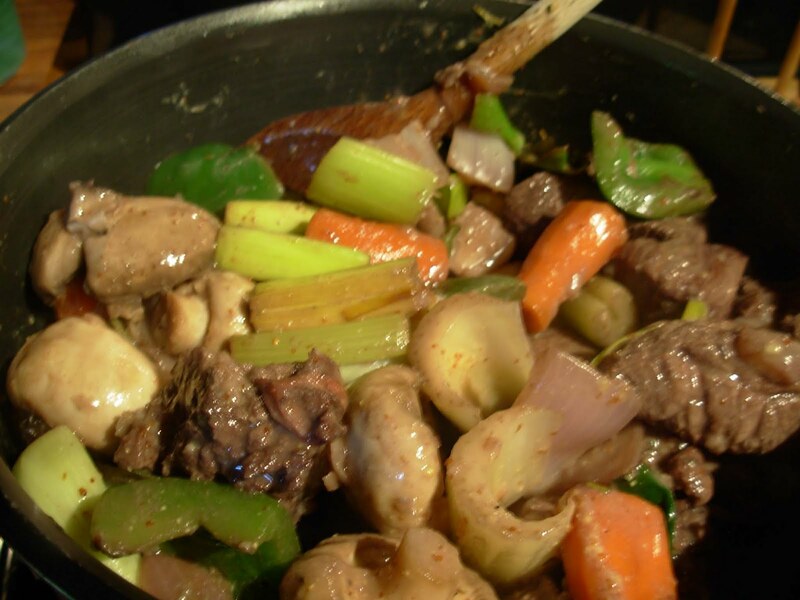 In many old cultures, such as Chinese and Hawaiian, wasting food is frowned on. I usually try to use every usable parts in most of my cooking. Actually there is a lot of flavor in some of the “discards”. As I mentioned yesterday, we went to a lobster boil and I took home the 5 extra heads that my friends didn’t want to venture with. I was allergic to shellfish as a child, but I was required to help picking crabs for our family restaurants during my late teen years whenever I was back in Singapore. I didn't start eating seafood till I moved to Hawai'i. I learned to eat lobster at my friend, Matt's in MA. I still remember his mother taught me how to take apart a lobster like a REAL Bostonian!! I was going to make stock and freeze it for later. However, the weather was a bit crazy here, we had pouring rain, then tornado warning, actual tornado touch down northeast of the house. I decided to stay home and make some soup. I was going make chowder; Mr. Wonderful seems to like heartier soup. However with the crazy storm, I couldn’t get out of the house! I also found a piece of kielbasa with the lobster heads… Hmmm sausage? Shellfish? Rice… Let’s cook a little Creole here. Break down 5 leftover heads; remove tomalley and body meat, reserve for later use. 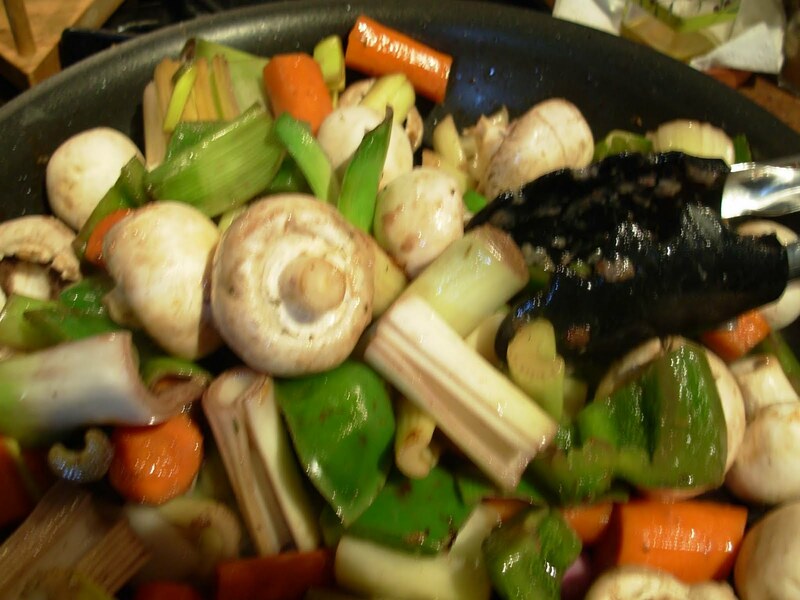 Prepare the vegetable and soup ingredients while making the stock. 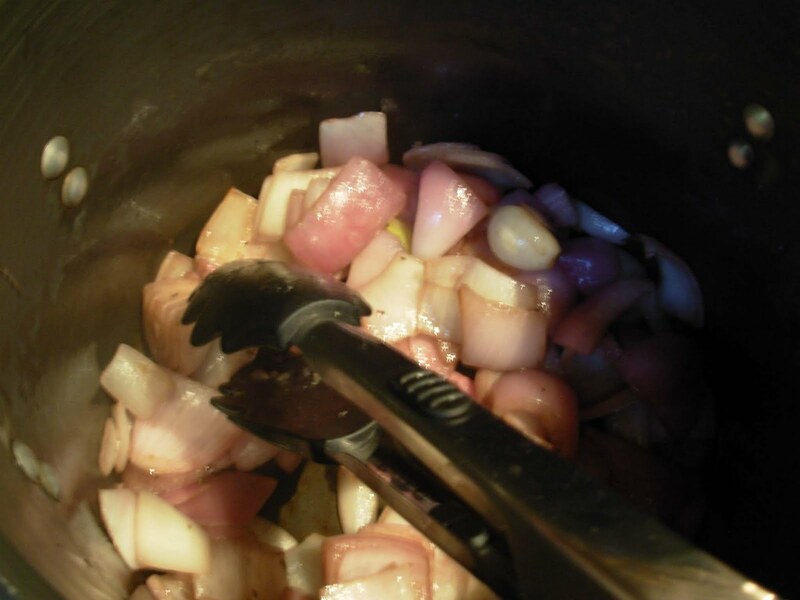 Sauté chopped garlic and onion, add crushed garlic. Add sausage and brown lightly. Add rice, mix well. Let the rice toast for a min or so to develop some flavor. Add 6 cups of stock, bring to a full boil. Ladle in to a bowl. Garnish with chopped parley and serve. If you are using fish, put uncooked large pieces into the soup and let it cook directly in the liquid. I would also add a sprinkle of lemon juice and lemon zest to the garnish when serving. What to do with ono leftover cardamon bread? Sometimes freezer can be full of surprises. As I was making a mushroom pot roast for Mr Wonderful for the week, I found ½ load of cardamom bread from Tobies. I bought it on the way back to the city from Momi’s amazing yoga retreat a month ago. I brought home 5 lobster heads too, it will be wonderful for stock! In a medium bowl, whisk 2 eggs, Add sugar. Mix in buttermilk till blended. Fold in butter. Add bread piece, make sure it is well soaked, you may need to add a little bit more milk, depending on the size of the load and the texture. The bread I used was quite soft and not dense. Heat oven to 350. Grease or spray a 8x8 square glass pan. Gently fold blueberries into the bread mixture. Let the pudding stand for about 10 mins. Cut into squares and serve with ice cream and/or with the simple blueberry syrup (About 8 serving). Combine all in a 2 cups measuring cup. Microwave on high for 2 mins. 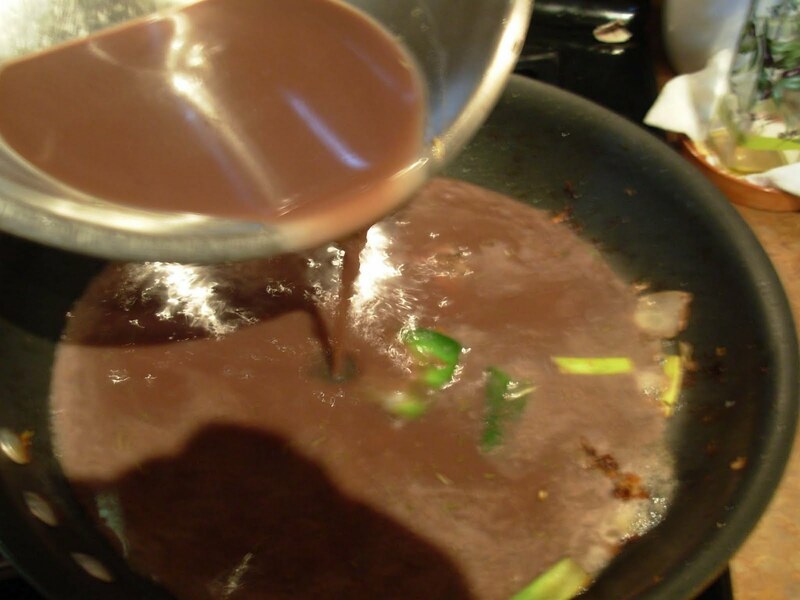 It will boil in the cup and thicken slightly. Remove from microwave, stir and let stand for a few min. Stir again. Here I am... my first posting!! 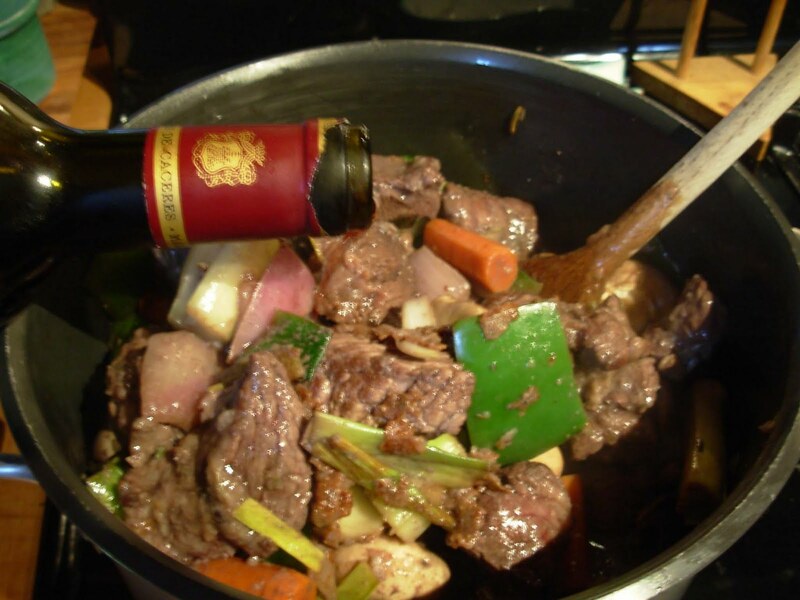 I would like to start with honoring one of my favorite Food author, Julia Child. Since I didn't grow up in this country, my memory of her only goes back to my college days. 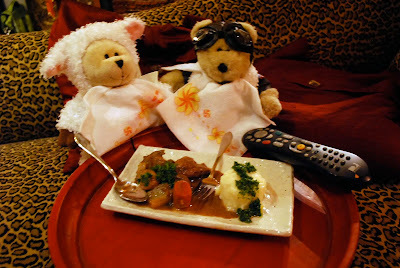 I was visiting my college best friend, Matt, last weekend and we watched Julie and Julia. Matt and I used to cooked together "Julia Child's cooking show" style. Actually Matt was the one who encouraged me to start this blog, so this is for you too Matthew. It can't be more appropriate to post my version of Boeuf Bourguignon. So here it is my version, I use a lot more vegetable and I don’t use pork or bacon in this variation. peppercorns and bay leaves.Add the beef, mix well. other vegetables. Discard the peppercorns, and parsley stems. 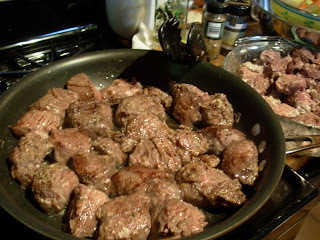 Heat 6 tbsp olive oil in large fry pan over high heat, brown beef in batches evenly, remove beef to a large bowl. shallot and onion to the pan, saute till soften. 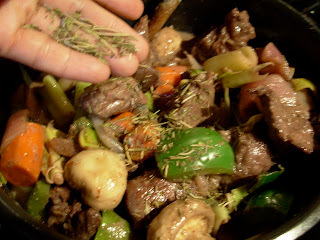 Add beef to the large pot. browned the beef in, cook over high heat for a few mins. Add the reserved marinade liquid to the pan to deglaze. Bring to boil. Taste and season with salt and pepper. 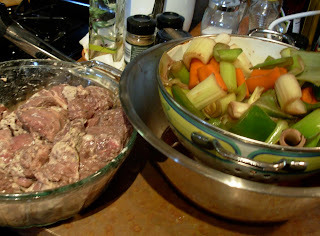 Add the liquid to the large pot, coat the meat and vegetable well. Add the remaining rosemary and thyme. 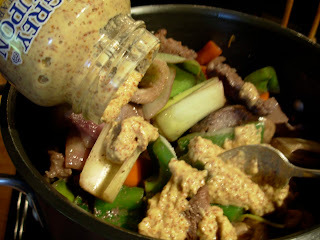 Add in the jar of Dijon Mustard. Mix well. the meat and vegetable. Bring the mixture to a boil, season with salt and pepper. Cover and simmer at low heat for about 2 hrs till the meat is folk tender. make up to about 3 cups. with a whisk, make sure you don’t have many lumps. vegetable back in and coat. Serve. Garnish with chopped parley. 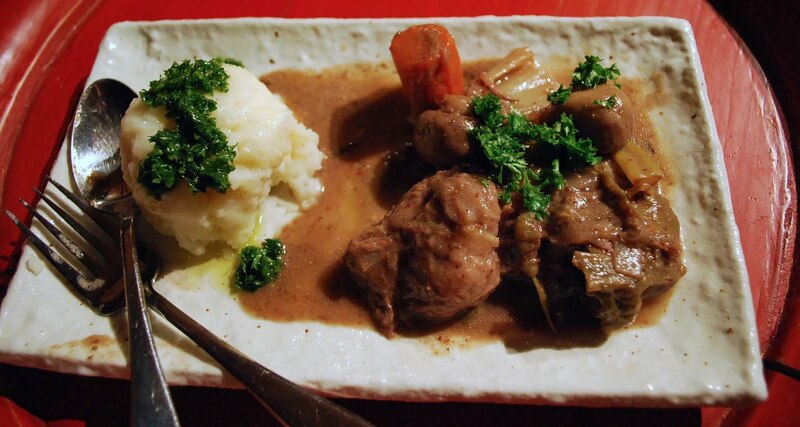 I love to serve this with low fat mashed yukon potatoes topped with parsley pesto on a cold winter night. Here is my boys, sharing their TV dinner!